It was early on a Sunday morning when the phone rang at his Dayton home. A voice on the other end told a sleepy Reza Masoudi to expect a call in 10 minutes from Farah Pahlavi, the exiled empress of Iran who promoted culture and the arts during her reign and was known for her fashionable dresses. 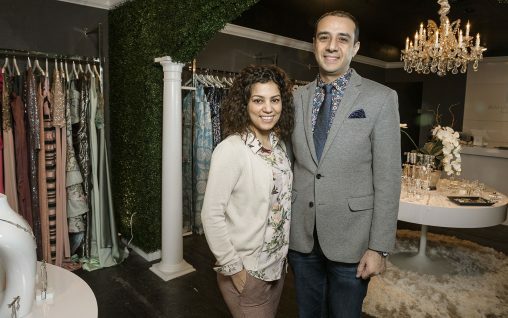 For the previous two years, the Wright State University alumnus and Iranian native had been emailing and leaving voice messages at Pahlavi’s office in hopes of getting her interested in wearing Persian-design dresses from him and his wife, Bahar, who had just started a dress-making business. Sure enough, Pahlavi called from Paris. She and Masoudi talked for 45 minutes, a conversation that would lead to a face-to-face meeting in 2010 between the Masoudis and Pahlavi at her U.S. home and mark the beginning of a relationship that would have the couple making 20 dresses for the empress over the next nine years. In 2012, Pahlavi wore one of the dresses to a highly photographed arts awards gala in Stockholm, Sweden, attended by Queen Noor of Jordan. Today, photos of Pahlavi in Masoudi dresses hang on the showroom walls of Bahar & Reza, the Masoudis’ dress shop in suburban Oakwood. Also hanging in the showroom is a chandelier and rows of spectacular dresses — from a pink sequined cocktail dress to gowns of colorful silk and lace. Masoudi dresses have been spotted at Academy Awards after-parties and the Golden Globes. First Lady Fran DeWine wore one at her husband’s inaugural gubernatorial gala at the Ohio Statehouse in January. Customers come from Chicago and live as far away as San Francisco. One wag accused the couple of trying to make a success in Dayton of a business more suited to Rodeo Drive in Beverly Hills. But the shop has found a footing here and is getting attention. Bahar & Reza has been featured in the Oakwood Register, the Dayton Business Journal and was the subject of a documentary on “The Art Show” on PBS-member station ThinkTV. Masoudi grew up in Tehran, the son of schoolteachers. He studied architecture in high school and actually designed a medical clinic for a group of seven physicians. Masoudi’s boyhood and adolescence in the late 1970s and ’80s were buffeted by political turmoil, revolution, the Iran-Iraq War and the changing ideology of the government. At one point, bombings forced Masoudi and his family to flee the city for about six months. Bahar & Reza dresses have been spotted at Academy Awards after-parties and the Golden Globes. In 1995, Masoudi began studying graphic design in the University of Tehran system, where he met Bahar, an art student who would execute some of his fashion designs. After graduating, Masoudi left Iran to live in Germany because he felt a bit alienated from Iranian society. In 2001, he came to the United States as an immigrant, settling in Dayton at the suggestion of some Iranian friends. He enrolled at Sinclair Community College to strengthen his English skills and selected architecture as his major. While he was at Sinclair, Masoudi worked at one of the parking garages. While sitting in a booth and collecting parking fees was below his skill level, the job enabled him to study and complete homework. Masoudi later landed a job at a florist by exaggerating his experience in floral design. It turned out he was a brilliant designer, creating unique bouquets and winning praises from happy customers. His next job was at another florist, and then there were a string of jobs with architecture firms, one of which involved designing furniture for schools and hospitals. Along the way, Masoudi transferred to Wright State, where in 2006 he earned his bachelor of fine arts degree with a certificate in interior design. In 2008, Masoudi married Bahar and she joined him in Dayton. The couple discussed creating a business together using Persian designs and motifs. After the revolution, Iran disconnected itself from the West, ending the exposure of Persian motifs championed by the royal family. Empress Pahlavi had established a museum in Iran with a large collection of Western modern art and had often been featured in Western magazines wearing dresses with Persian designs. The Masoudis launched their business by making and selling a few accessories — neckties and scarves — that quickly sold out on eBay. The couple then expanded by moving into women’s apparel and creating their own website. They hired a photographer, models and scheduled their first photo shoot in a small studio above a restaurant in the tiny western Ohio village of Arcanum. All the while, Masoudi was working to get the attention of Pahlavi. Then came that fateful phone call from Pahlavi in 2010 and an appointment to meet with her. The Masoudis watched videos on royal protocol and etiquette and practicing bowing and shaking hands. They arrived at Pahlavi’s home with sketches of three dresses, several fabric samples and a measuring tape. They were shown to the living room and a few minutes later heard the “tap, tap, tap” of approaching heels. Pahlavi wanted all three dresses and needed one of them in two weeks to wear to a wedding, which the Masoudis shipped to her in time for the event. The evening of the wedding, Reza and Bahar were cooking out with some friends on their backyard patio when the telephone rang with the Caller ID flashing “unknown.” It was Pahlavi calling from her car on the way home from the wedding to thank the couple. She said the dress brought back good memories from her past. “‘You made my day because as soon as I got out of the car the people started clapping,’” Pahlavi told Reza. The dresses for Pahlavi signaled the beginning of the Masoudis’ successful dress-making venture. They first showed their dresses at the Defy fashion show in Dayton. That was followed by a show in Indianapolis, an international couture show in Washington, D.C., and then Los Angeles. The Masoudis were urged to open showrooms in New York City and Los Angeles but ultimately decided to stay in the Dayton area. They opened their shop and showroom in Oakwood in 2016. Prior to creating dresses, the Masoudis will interview the customers to get their ideas. Taken into account are favorite colors and the type of event where the dress will be worn and whether the event is in summer or winter, inside or out. Many customers abhor online shopping, preferring a more personal experience. And most want a unique dress. “They want something that nobody else has,” said Bahar.